Hunger Games Dress with LED Fire #WearableWednesday « Adafruit Industries – Makers, hackers, artists, designers and engineers! I was nominated for Geek of the Year in Philadelphia, which was the perfect excuse to come up with a geek inspired outfit. I remembered seeing the Hunger Games movie with the flaming wedding dress, and even then I had the idea of creating flames with LEDs. So, I bought a slightly used wedding dress and petticoat from Ebay and got to work. My idea was to spin in the dress and cause LEDs to turn on. So, for starters I knew I would be using NeoPixel 30 strips in white. I couldn’t afford 9 meters, so I went with 7 — a total of 208 pixels. Using organza ribbon (to save on stitching time), I folded it over and stitched it near the edge to seal it. Then, I stitched both edges of the ribbon onto the bottom of the petticoat in a spiral, creating a casing for over three rows of pixels. Preparing the NeoPixels strips was easy. I removed the weatherproof casing and then soldered the strips together with tiny pieces of Adafruit’s new silicone wire. Can I tell you how much I love this wire? It’s like spaghetti! It’s easy to remove the shielding, and once soldered, it allows your piece to be quite flexible — perfect for a wearable. 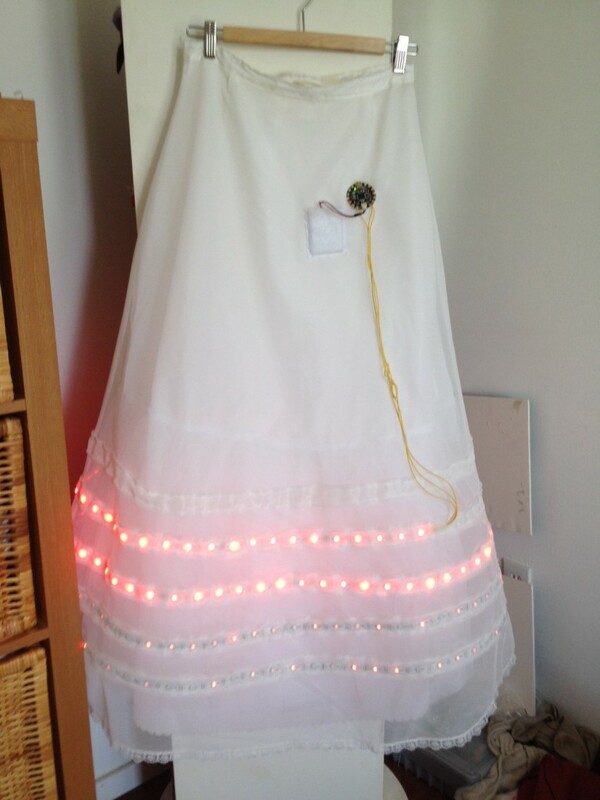 I slid the NeoPixel strips into the long casing on the petticoat, not only allowing for illumination, but also creating the modern day “hoop” feeling which is perfect for a ball gown. 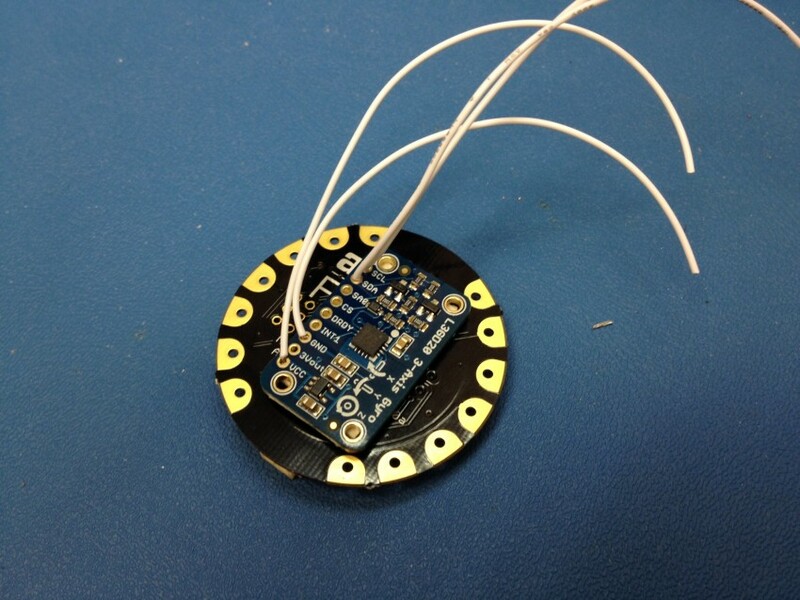 In order for the dress to react to a spin, I learned that I would need a gyrosensor. Adafruit was out of stock for the one that matches the FLORA, so I went with the flat breakout board. I soldered up the wires and attached it to the back of the FLORA with foam adhesive tape. After running a few tests of the gyro, watching numbers fly by on Arduino’s serial monitor, I figured out which scale worked best for the spin. Now that it was working, it was time to attach it to the large LED strip. Since this was going to be a wearable with lots of movement, I used more of the silicone wire and then hot glued all solder points, to add durability. Then, I uploaded a program I hacked from Paul Craven’s Light Strip Tube Lamp. The last part entailed the decorations on the bodice, which really make the dress memorable. 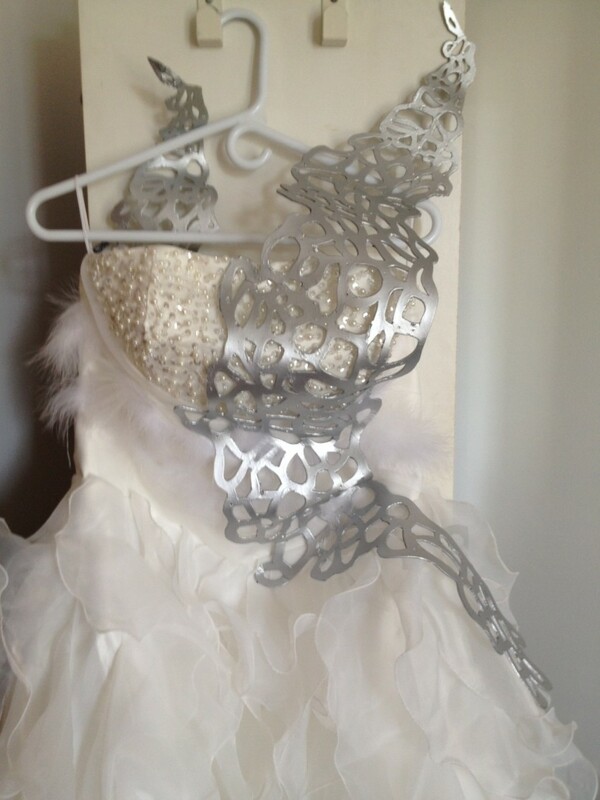 I used feather trim and hot glued it into the tucks in the organza. Then it was time to tackle the most difficult part, creating wings that looked lasercut on a budget. I learned about a method using craft foam from a cosplay website. My husband enlarged the actual costume shot from the movie, and helped me to create a pattern. The wings were then cut with an Exacto knife and painted with five coats of glue, two coats of chrome acrylic and two coats of poly. They ended up being somewhat stiff, but I heard that fabric backing would have been the ideal way to go for something firmer. I glued crystals onto the wings, as I believe the original design also had them, and then attached the wings to the bodice with some silver thread. One of the advantages of craft foam, besides being easy to shape with heat, is that it is also safe to wear in crowds. I didn’t win the prize for the biggest geek, but I definitely was the best dressed geek LOL. People who recognized the the dress from the movie were really blown away when they saw the spinning LED show. Probably out of the things I’ve made, this is my favorite; I continue to be inspired by movies and the beauty of diffused lighting. I’m sure a lot of you feel the same way, so get started on your own formal wear with the Sparkle Skirt tutorial. Or, if you want to be more like Katniss, order a gyro breakout board.